Is ‘Two Scoops’ the Future of Filmmaking? Introducing Two Scoops: The first crowdsourced movie. Earlier this year, director Robert Rodriguez — the violent mastermind behind From Dusk Till Dawn, Sin City and Machete — partnered with BlackBerry 10 on a new project: Two Scoops. “You,” as in us. The audience. The look of the monster the twin ice-cream scoopers were to fight and the weapon they were fighting it with was contributed via fans online. Fans also took part in the cast, filling the pictures on missing person posters. 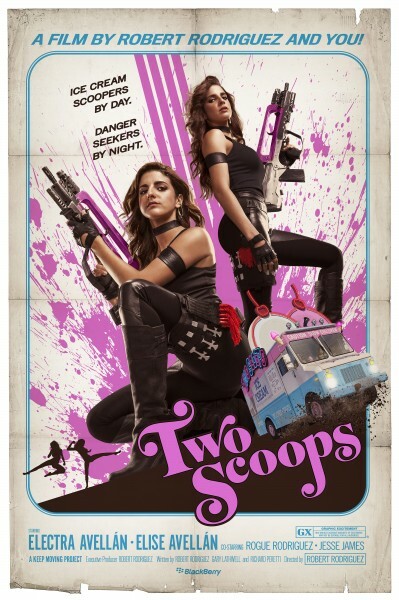 ‘Two Scoops’ is a cinematic adventure, created by Robert Rodriguez with the help of his fans. In the film, you will find a scene featuring ‘the agent,’ a secret weapon, and the monster. Each of these elements was either created or inspired by a fan of Robert Rodriguez. Throughout the film, you will also find missing person posters. Each of these ‘missing people’ are fans of Robert Rodriguez, who submitted their photos in order to appear in the film. How far away can we be from being able to vote on movie endings and have them show up on the screen? Or from choosing which character’s story we want to follow on a TV show? How long until cinema becomes a choose-your-own adventure affair? The shape of action flicks to come. Rodriguez has a Machete sequel called Machete Kills coming later this year, and he won’t be crowdsourcing that one, but with interactivity always on the rise, maybe by the time the inevitable trilogy rounds out we’ll get there. What do you think of Two Scoops? Is it the next logical step in making movies? Will audience interaction with cinema work, or should we all just go back to waiting for the stories to show up in front of us? Leave a comment or a tweet and let us know! This entry was posted in The MG Blog and tagged crowdsourcing, robert rodqiguez, two scoops by summerm. Bookmark the permalink.